Virtually all Protoss warriors wear some kind of psionic power suit, which protects the wearer from damage and hostile environments, amplifies physical and psionic capabilities, etc. All such suits include a personal plasma shield generator, which maintains the environmental seal in the event of suit breaches. 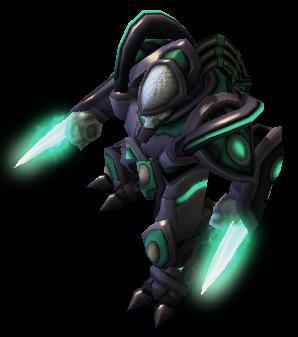 If using Battlesuit System Hit Locations, Protoss suits use the same rules and locations as Terran suits, but like all Protoss gear, electronics are largely psychotronic. Zealots, Purifiers, Vindicators, and other powered infantry warriors wear the standard Protoss power suit. Made of psionically-hardened crystalline-laminate over psychokinetic energy cloth, the suit is remarkably light and flexible for its size (SM +1, same as a normal Protoss wearer) and protective quality. Each fully-articulated glove can reconfigure itself on command into a Weapon Mount for Protoss infantry and melee weapons, and a standard suit has a Psi-Blade that projects from one glove (although many Zealots favor dual Psi-Blade Gauntlets over the single lighter blade). Advantages: DR 120 + Plasma Shields (DR 60; regenerates 1 DR/sec), Lifting & Striking ST +20, Basic Move +2, Enhanced Move 1 (Ground), Pressure Support 2, Protected Senses (All), Radiation Tolerance 10, Sealed, Super Jump 1, Temperature Tolerance 20, Vacuum Support. Integrated Components: Gripboots (Climbing +1; Kick damage +1/die; Sure-Footed), IR-Cloaking and Radar Stealth (-6 to detect with infrared or radar), Life Support (Indefinitely provides for all biological needs of a Protoss wearer), Psi-Amplifier Helmet (+1 to all Psionic success rolls), Striking Surface (Punch damage +1), and Death-Warp System. Weight 100 lbs (doesn't count as encumbrance as long as the wearer is telepathically interfaced). Identical to a standard power suit, but lighter; common to High and Dark Templars, pilots, and others who hope to avoid too much direct combat. Advantages & Components: As Standard Power Suit, but DR 90 + Plasma Shields (DR 60; regenerates 1 DR/sec), Lifting & Striking ST +15. Weight 60 lbs (doesn't count as encumbrance as long as the wearer is telepathically interfaced).